A Conversation with M.M. 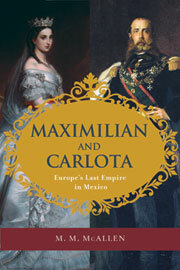 McAllen about her book, Maximilian and Carlota: Europe's Last Empire in Mexico. Recorded in the Twig Book Shop in San Antonio in October 2015. For the American Literary Translation Association's Café Latino at the Café Passé in Tucson, Arizona, October 30, 2015. 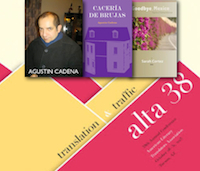 For more about Agustín Cadena, visit his blog El vino y la hiel. For more about C.M. Mayo's translations, click here. An interview with the author of Lynching Pascual Orozco: Mexican Revolutionary Hero and Paradox. Recorded in October 2015. Greg Kaminsky interviews C.M. Mayo about Metaphysical Odyssey into the Mexican Revolution: Francisco I. Madero and His Secret Book, Spiritist Manual. "I found C.M. Mayos book to be very engaging and well-written. This is not your typical history, or even esoteric history book. Mayo is a profoundly creative and insightful artist who is able to bring her own perspective into the frame while enhancing our understanding of her subjects. This is a masterful introduction to a topic that hasnt been explored in this accessible way before, and may never be again. If you enjoy esotericism, history, politics, and the way that they sometimes intersect, I highly recommend you read C.M. 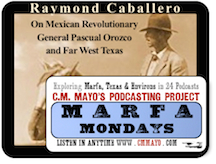 Mayos Metaphysical Odyssey into the Mexican Revolution." Dr. Rita Louise interviews C.M. Mayo for Just Energy Radio. August 6, 2015. Una conversación con C.M. Mayo acerca de su libro Odisea metafísica hacia la Revolución Mexicana, Francisco I. Madero y su libro secreto, Manual espírita. 14 de marzo, 2015. RecordeHi on January 29, 2015 in La Jolla, CA, at the University of California San Diego Center for US-Mexican Studies: C.M. Mayo discusses her new book, Metaphysical Odyssey into the Mexican Revolution: Francisco I. Madero and His Secret Book, Spiritist Manual. On January 13, 2015, as the first speaker of the 2015 San Miguel PEN reading series in Bellas Artes, San Miguel de Allende, Mexico, C.M. Mayo reads from and discusses her new book, Metaphysical Odyssey into the Mexican Revolution: Francisco I. Madero and His Secret Book, Spiritist Manual. Rose Mary Salum on founding Literal Magazine and Literal Publishing and her visionary anthology, Delta de las arenas, a collection of Arab and Jewish stories from Latin America. For the Conversations with Other Writers occasional series. Recorded in November 2013 and posted in January 2015. 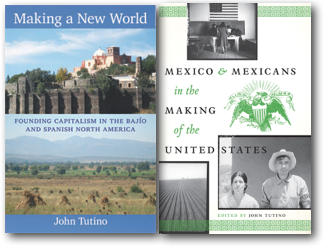 For the Marfa Mondays Podcasting Project, an interview with John Tutino, Professor of the History of Mexico and the Americas in the History Department and the School of Foreign Service at Georgetown University in Washington DC, author of Making a New World: Founding Capitalism in the Bajío and Spanish North America (Duke University Press) and editor of the anthology Mexico and Mexicans in the Making of the United States (University of Texas Press). Recorded in April 2013. Sergio Troncoso on writing his novel From This Wicked Patch of Dust; El Paso, family, reading and visual culture, writing literary novels, blogging, New York publishing, Chicano literature, US-Mexico border history, and 9/11. Recorded by Skype, summer 2012. 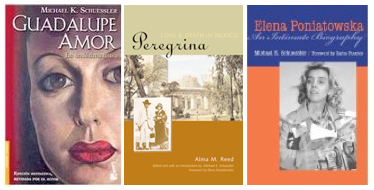 Michael K. Schuessler on Mexico's incomparable poet Guadalupe (Pita) Amor; her neice, Mexico's acclaimed novelist and journalist Elena Poniatowska; the baroque literary prodigy Sor Juana Inés de la Cruz; and the great friend of Mexico, the adventurous and passionate journalist Alma Reed, whose autobiographya work vital to early 20th century Yucatecan history Schuessler rescued from an abandoned closet. Recorded in Mexico City on March 8, 2012. Edward Swift is an artist and the author of the memoir My Grandfather's Finger, in addition to several acclaimed novels, most recently, The Daughter of the Doctor and the Saint. Recorded in his studio in San Miguel de Allende, Mexico, the conversation ranges from the Orphic journey to Texas's Big Thicket, Marguerite Young, Proust, Greenwich Village, and the wonders of Mexico's little-known Sierra Gorda. Recorded on Feb 22, 2012. Recorded at the PEN / Sol Literary Magazine Reading Series event of February 22, 2012 in San Miguel de Allende, Mexico. C.M. Mayo introduces and discusses her translation the first into English of Francisco I. Madero's secret book of 1911, Spiritist Manual. Madero was the leader of Mexico's 1910 Revolution and President of Mexico from 1911-1913. 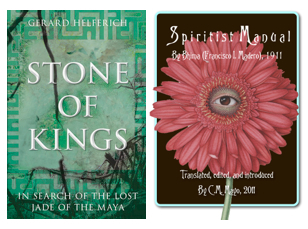 (Note: this is an abbreviated version of the longer podcast, listed directly below, with fellow author Gerard Helferich, who read from his book, Stone of Kings.) *26 1/2 minutes. UPDATE: The all-new book-length introduction, Metaphysical Odyssey Into the Mexican Revolution: Francisco I. Madero and His Secret Book, Spiritist Manual, was published in late 2013 in Kindle and 2014 in paperback. Eva Hunter, editor of Sol Literary Magazine. Recorded on February 22, 2012 in the Biblioteca Pública. A reading of C.M. Mayo's article originally published in Inside Mexico, March 2009, with the author of Villa Air-Bel: World War II, Escape, and a House in Marseilles. C.M. Mayo reads an excerpt from Miraculous Air: Journey of a Thousand Miles through Baja California, the other Mexico, from the chapter about the Jesuit Conquest and Mission San Ignacio. C.M. Mayo reads the prologue from her collection of 24 Mexican writers, Mexico: A Traveler's Literary Companion. C.M. Mayo reads from and discusses her novel based on the true story. Recorded January 19, 2011 in the Biblioteca, San Miguel de Allende, Mexico. "Hell, I Knew It Was Paradise"
C.M. Mayo reads an excerpt from Miraculous Air: Journey of a Thousand Miles through Baja California, the Other Mexico (Milkweed Editions, 2007) from the chapter "The Sea is Cortes," about a visit to the East Cape for an interview with Bob Van Wormer and the story of Baja California's spectacular sportfishing industry. C.M. Mayo reads her guest-blog post for "Hist Fic Chick" Blog, October 15, 2010, about writing The Last Prince of the Mexican Empire. How thin is the veil between our world and the next? A presentation of the the novel, The Last Prince of the Mexican Empire, and an overview of the author's research in the various archives in the Library of Congress, among them, the papers of the Iturbide family, the Emperor Iturbide, and the circa 1920 copies of a substantial portion of the Kaiser Maximilian von Mexiko archive in Vienna. The lecture was sponsored by the Hispanic Division of the Library of Congress, which is the center for the study of the cultures and societies of Latin America, the Caribbean, the Iberian Peninsula and the Spanish Borderlands, and other areas with Spanish and Portuguese influence. Recorded live July 20, 2009. A presentation of the the novel, The Last Prince of the Mexican Empire, with special emphasis on Washington DC history (notably Georgetown and Rosedale, the historical estate in Cleveland Park) and an overview of the author's research in the Historical Society of Washington DC. Recorded live October 18, 2009. National Public Radio John Ydstie interviews C.M. Mayo about literary translation and Mexico: A Traveler's Literary Companion. April 1st 2006. Tonya and Ian Fitzpatrick interview C.M. Mayo about Mexico: A Traveler's Literary Companion, Miraculous Air and Mexico's Baja California peninsula, Mexico City,the forthcoming novel, The Last Prince of the Mexican Empire, and more. January 6, 2009.